Fun With Origami: 17 Easy-To-Do Projects & 24 Sheets Of Origami Paper Just $2 Down From $6! You are here: Home / Great Deals / Amazon Deals / Fun With Origami: 17 Easy-To-Do Projects & 24 Sheets Of Origami Paper Just $2 Down From $6! Here’s a fun Amazon deal. 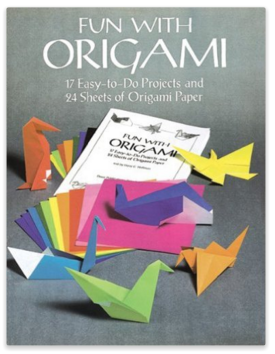 Fun With Origami: 17 Easy-To-Do Projects & 24 Sheets Of Origami Paper is just $2 down from $6! Get yours now while it lasts! Simple instructions, over 100 clearly drawn diagrams, and a supply of authentic origami paper (24 sheets, each 7″ x 7″, in 12 different colors) help beginners master such simple shapes as a sail boat, jet plane, and paper cup. Intermediate-level paperfolders may find the bird, whale, fish, and penguin more appropriate for their skills, while veteran origamists can enjoy the challenge of creating a seal, butterfly, flapping hand, and other figures.